Maintaining the right humidity level in your environment is important for a number of reasons. Too little moisture may create a lot of discomfort for your household by giving you chapped lips and furniture cracks. Extensive moisture, on the other hand, may serve your house as a breeding place for mildew and mold along with numerous health issues. Having a whole house dehumidifier in such a scenario can prove to be of great worth, as it helps you sustain the moisture in your air at optimum levels. Spending some money to buy a quality whole house dehumidifier is much better rather than getting miserable due to a number of health issues, like respiratory problems, skin issues, and cardiac ailments. Such a device helps you free your entire house of excessive moisture levels, including your living room, crawl spaces, and basements. But before choosing any, you need to have a clear idea of the way they work as well as their functioning methods. There are different types of dehumidifiers but if you are interested in dehumidifying your entire house conveniently, it is recommended to check out the best whole house dehumidifiers currently available on the market. A comprehensive guide discussing various aspects of such type of dehumidification systems is given in the sections below. A thorough research report offering technical details on some of the best whole house dehumidifiers out there is also attached with this guide. Who Are Whole House Dehumidifiers For? What Makes a Good Whole House Dehumidifier? We have been updating this website for about 4 years now. During this tenure, we have reported to you firsthand information on a variety of products. We have considered a number of best whole house dehumidifiers while conducted different tests on the majority of them. To facilitate our readers in figuring out the most well-suited product, we spent more than 55 hours to carry out our web research on numerous whole house dehumidifiers. The best part is that our team has tested most of these products itself and we have received countless reviews from their actual users as well. As usual, the main aim of this guide is to help our readers find out the best whole house dehumidifiers for them without promoting some particular brand name. Keeping that under consideration, we have managed to pick the most powerful and famous whole house dehumidifiers for sale. We have also attached a comprehensive report shedding some light on the technical ratings of all of these units. What Is Exactly Meant by a Whole House Dehumidifier? The whole house dehumidifier may be referred to as a dehumidification system that sustains the overall moisture level of your entire house at the optimal levels. It serves as a convenient way of keeping your whole house comfortable, healthy and most important free of moisture. There are various kinds of whole house dehumidifier systems but two of them are more prominent in comparison to others. Some of the models are directly connected to a house’s HVAC system and perform the dehumidification phenomenon through the already installed air ducts. The second kind, on the other hand, comprises of portable house dehumidifiers that are powerful enough to carry out dehumidification of your home’s entire area. Both these types slightly vary from each other on the basis of costs and performance. Regardless of the fact that you own an air conditioning system or not, having a whole house dehumidifier may come in useful for your household. Every house has places like laundry rooms and basements where there are excessive amounts of moisture. These rooms sometimes tend to upset the moisture levels of the entire house, thus creating different types of issues, such as the growth of mildew and mold, occurrence of water spots and moisture stains, etc. Having an out of balance humidity level in your house may lead towards propagation of several respiratory and skin related ailments. So the best course of action in such a scenario is to get yourself a whole house dehumidifier. A few of the people who might benefit from buying a whole house dehumidifier are discussed below. Small, portable dehumidifiers usually come with small water buckets for storage of the condensate. Since whole house dehumidifiers work on the dehumidification of the entire house, they are associated with high levels of drainage. That’s the reason why these devices offer continuous drainage feature. If you have been affected by some sort of allergy, you would know that it does not go well with extensive moisture. As a matter of fact, humidity higher than a certain level causes different allergies to propagate notably. Having the best whole house dehumidifiers can certainly ease things up for you in such a scenario. It is common knowledge that the air that is best suited for breathing contains an optimum amount of moisture. So if you are interested in having a perfectly balanced breathing environment in your entire house, buying a whole house dehumidifier would be a good fit. Extensive humidity serves as a hospitable environment for the growth of mildew and mold. Having a whole house dehumidifier puts a stop to the propagation of unwanted organic materials immediately. When looking for the best whole house dehumidifiers, it is important to make sure your unit is powerful enough to dehumidify the entire house effectively. Consider the following factors to figure that out. If your house is moderately damp, it is recommended to get a dehumidifier that might dehumidify 10 pints or 4.73 liters of moisture from a covered area of 500 square feet or 46.45 square meters. You may add about 4 pints or 1.89 liters to this amount for every extra 500 sq. ft. or 46.45 sq. m. For instance, if you have a room that covers an area of 1500 sq. ft. or 139.35 sq. m., get a whole house dehumidifier system capable of extracting 18 pints or 8.51 liters of moisture. 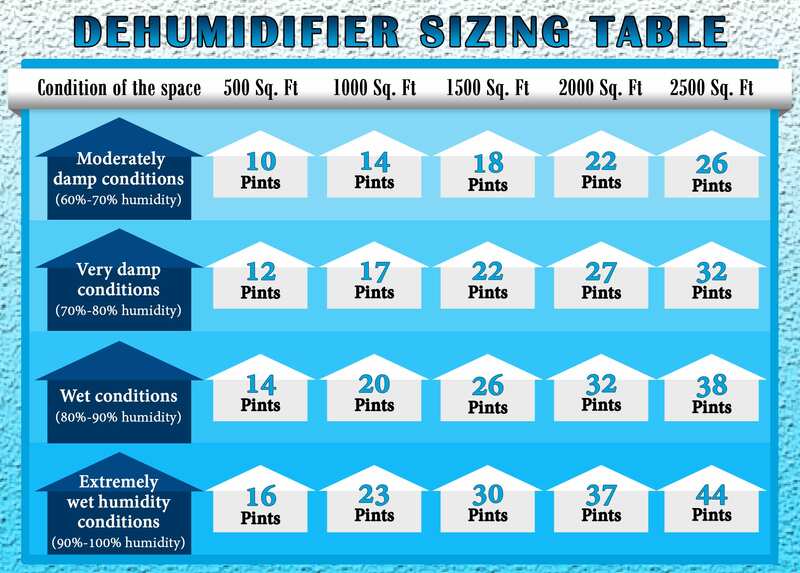 If you are living in a house that suffers extremely damp conditions, it is advisable to get a dehumidifier strong enough to dehumidify 12 pints or 5.67 liters of moisture per 500 sq. ft. or 46.45 sq. m. You may add up an amount of 5 pints or 2.36 liters for each 500 sq. ft. or 46.45 sq. m.
In case your living space is suffering from wet conditions, it is advisable to buy a whole house dehumidifier with a moisture capacity of 14 pints or 7.57 liters per 500 sq. ft. or 46.45 sq. m. You may also add another 6 pints or 2.83 liters per every additional square footage of 500 sq. ft. or 46.45 sq. m.
For houses that suffer from extremely wet conditions, get a top-rated whole house dehumidifier with the capability to extract 16 pints or 7.57 liters of moisture for every 500 sq. ft. or 46.45 sq. m. 7 pints or 3.31 liters may be added for every other 500 sq. ft. or 46.45 sq. m.
ACH stands for air changes per hour, which may be referred to as the no. of times the air passes through a dehumidification system every hour. This helps in figuring out the required airflow for dehumidifying the entire area properly. Some of the recommendations made on the basis of humidity levels are given in the paragraphs ahead. In case of extremely wet air conditions, humidity levels are usually somewhere in between 90% and 100% where standing water or puddles are often seen. So the optimum ACH in such a scenario is 6. In case of wet climatic conditions, humidity levels lie somewhere around 80% or 90%. Wet spots, visible stains or mildew condition may also be experienced. So the optimum ACH should be 5. Humidity levels for such a scenario sustain in between 70% and 80%. Visible moisture sitting on your walls or the flooring may be seen along with a certain mildew smell. The recommended ACH is 4. For rooms sustaining damp conditions, humidity levels are around 60% or 70%. The area produces a musty smell and feels pretty damp especially in the humid weather. Crawlspaces, as well as basements, usually experience such type of conditions. The optimum ACH for such a scenario should be 3. To calculate the optimal CFM (Cubic Feet Per Minute) and locate your best-suited dehumidification system, multiply the space’s cubic square footage (LxWxH) by the ACH level and then divide the result by 60 mins. If you cannot identify a dehumidification system having the right CFM level for your needs, you may buy two individual units. Would I Be Better off with a “Whole House” Unit or a Couple of Smaller Models? Numerous whole house dehumidifiers are currently available on the market. They claim to properly dehumidify massive spaces but their performance depends upon the airflow going on around the area of operation. In case the air present in your house finds it hard to conveniently flow from one part of your house to another, the performance of a whole house dehumidifier would reduce notably. In such a scenario, the flow of air may be enhanced by making using of small portable fans or ceiling fans since it directs from different parts of the house to the dehumidifier easily. The other option would be purchasing two smaller dehumidification units and placing them in separate parts of the house. When you are looking to purchase a whole house dehumidifier for your house, there are certain things that must be kept under consideration for making the best choice and enjoying the optimum benefits. 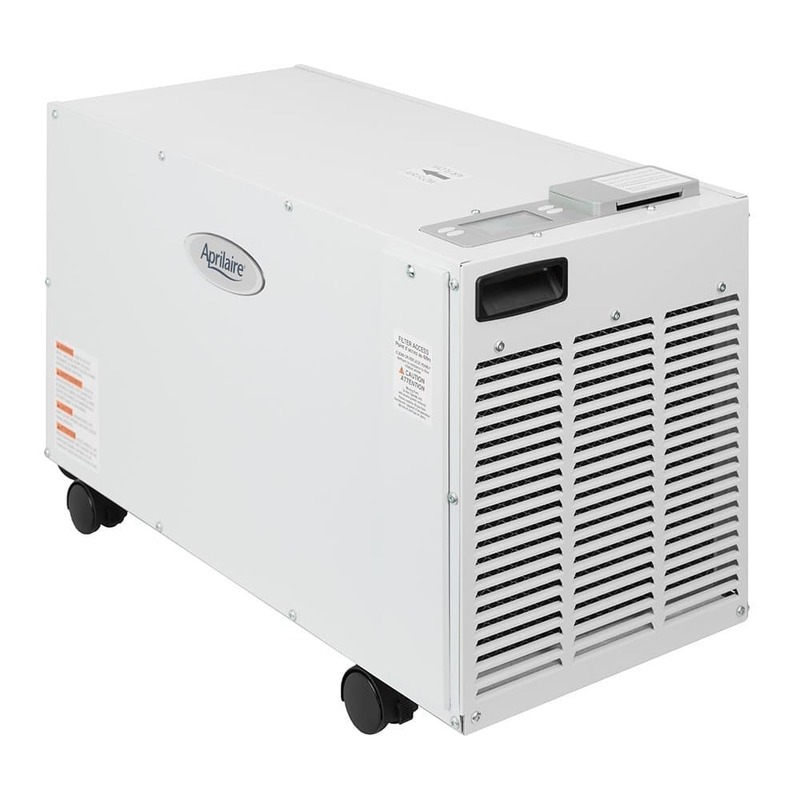 The following factors can help you choose the right unit from numerous options where all claim to be the best whole house dehumidifiers. Coverage capacity is one of the most important considerations while buying a top-rated whole house dehumidifier. It is critical to make sure your potential purchase is strong enough to dehumidify your entire house properly. To learn about the appropriate coverage capacity as per your needs, you may refer to the recommendations made in the above section on How to Choose the Right Capacity for Your Dehumidifier. Build quality is another important consideration while you are buying a whole house dehumidifier system. Some of these products are installed in your existing HVAC system while others are portable and may be moved around the house. You need to figure out which one of the two best suits your requirements and make the purchase. Having one of the best whole house dehumidifiers come in handy when you are interested in warming up the house in addition to dehumidifying it. Desiccant dehumidifiers deliver better performance while dealing with low temperatures. Compressor-based models, on the other hand, are not likely to operate below a certain temperature limit. So if your house experiences low temperatures, getting a desiccant dehumidifier might be a better choice. Since you are looking for a whole house dehumidifier system, it is important to make sure it has a pint capacity large enough to dehumidify the whole space. Prefer a product with a pint capacity of 70 or more pints. Auto restart is a highly desirable feature when it comes to whole house dehumidifiers. In the events of power cut or other similar actions causing your dehumidifier to shut off, it should be capable of restarting itself on its own. So prefer a system that comes with auto restart feature. Before making a buying decision for your new dehumidifier, you need to understand that the optimum humidity level for summers is in between 40% and 50% and in between 30% and 40% for winters. Sometimes you might want to switch above or below this optimum range for certain requirements, such as drying up your laundry. It is recommended to buy a whole house dehumidifier that features a built-in humidistat and allows you to adjust the humidity at required levels. Since a whole house dehumidifier is supposed to dehumidify your entire house, it would be associated with the generation of lots of drain water. So get a system that comes with automated drainage that continues uninterrupted operation all the time. Dehumidifiers can be associated with extensive noise levels especially when they are located somewhere near or inside your bedroom. Models with 2-speed fans not only operate at low noise but are energy efficient as well. So before making a purchase, it is recommended to test it for noise levels. Some home dehumidifiers feature detachable air filters that come in handy while protecting the internal coils from dust and dirt. So it is recommended to get removable and washable filters that might be cleaned off easily. Both portable as well as whole house dehumidifiers are available on the market. If you are currently using a portable dehumidifier, switching it to a whole house dehumidifier would be a great choice. Unlike portable dehumidifiers, whole house dehumidification systems are associated with powerful operations and are capable of removing extensive moisture from your entire house. The majority of the whole house dehumidifiers are installed into the existing HVAC system of your house. So they help you enjoy a noise-free dehumidification experience in comparison to that offered by portable ones. Last but not the least, having a portable dehumidifier with a small condensate bucket that remains full all the time might also be a sign for upgrading to a whole house dehumidifier. Before writing this guide, we carried out tens of hours of research work to come up with legitimate information on different operational aspects of the mentioned products. The process of selection involved in the research comprised of practical tests performed by several volunteers. For the 4 years that we have been running this website, we have researched on a number of whole house dehumidifiers. Better yet, we have tested their majority by ourselves. It would be wrong to say that the tested products are perfect and free of any possible refinements but they may undoubtedly be listed among the best choices out there. About 2 months were spent by our team on testing these products under different circumstances to figure out the legitimacy of their performance. The products were tested both with and without their operation guides. The performance of the tested products was measured by analyzing various features such as coverage capacity, pint capacity, usability, manufacturers, weight and size, appearance, drainage, noise levels, air filtration, automated shutoff, automated restart, low temperature operations and other similar factors that impact their performance the most. Our team carefully analyzed the below-mentioned products for 27 of the most important features in a whole house dehumidifier. Consequently, we also came up with a report featuring various technical credentials offered by these products. Our readers are strongly urged to like our social media pages to access that report. By reviewing that report, you may get a statistical analysis of all the products mentioned in this guide and it is supposed to make the buying decision much easier for you. With multiple features and amazing performance, this dehumidifier removes 95 pints in 24 hours! This unit is free standing with silent operation. It can be placed in just about any room. Before reviewing this unit, it is important for our readers to know why we had to make it our number 1 pick. As mentioned above, we carried out a 27-factor analysis on each of the products before listing them in this guide. 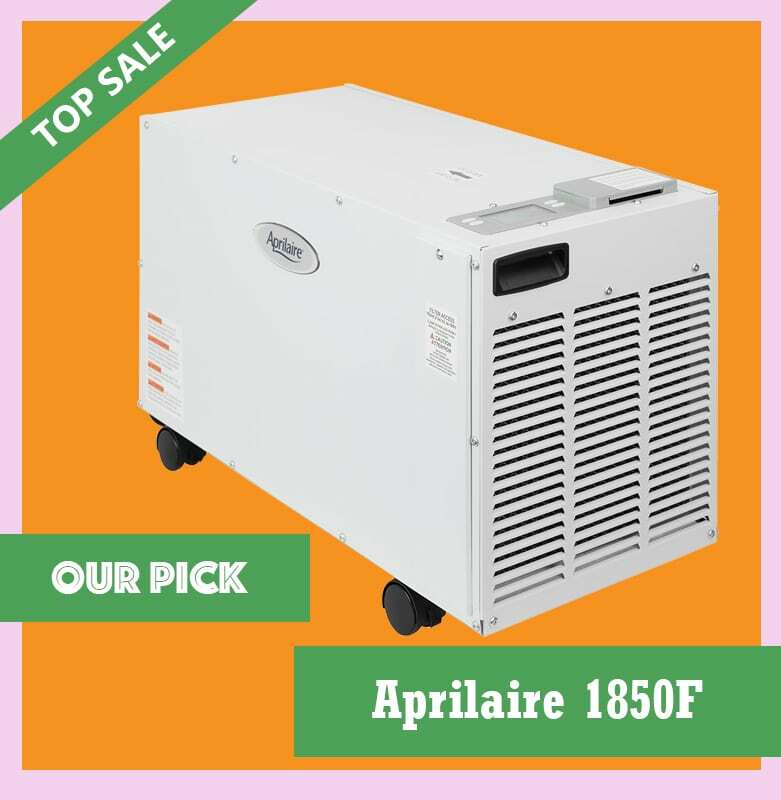 The Aprilaire 1850F 95 Pint whole house dehumidifier contained the highest number of features enlisted in that analysis. Moreover, it provided a unique blend of all the features that are considered important in determining the credibility of such a home appliance. In comparison to the other similar products we tested during our research, this one provides the largest coverage and moisture removal capacity. It is capable of removing 95 pints of moisture every 24 hours. Moreover, it effectively manages air quality and relative humidity in spaces as large as up to 5200 square feet. 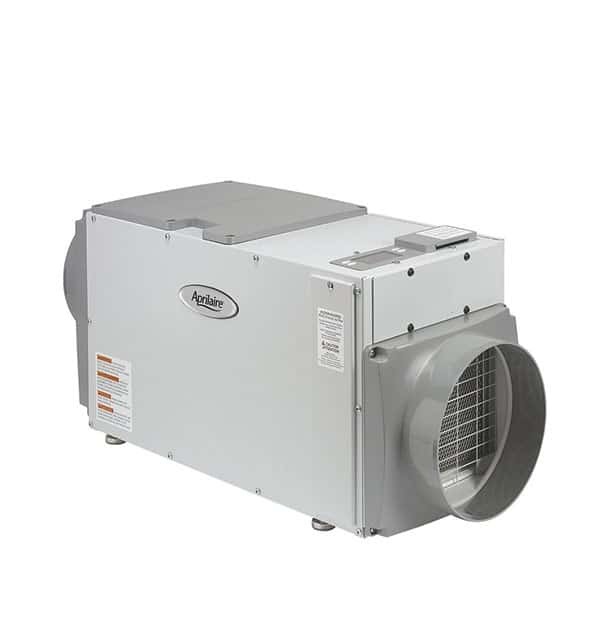 It also offers one of the largest airflow capacity of 256 cubic ft. per 60 seconds. It also comes with a built-in humidistat and a washable filter of ½’’ (MERV 8). The Aprilaire 1850F is a freestanding model and offers an elegant look that is perfect for both finished large rooms as well as unfinished basements. It helps you improve your entire environment by reducing the moisture amount down to the optimum levels. The Aprilaire 1850F 95 Pint whole house dehumidifier is a marvel in itself. It offers a variety of features along with a matchless performance that is hard to find elsewhere. You can go for it without any worries if you’re still wondering how to choose the right dehumidifier for you. This model holds a moisture removal capacity of up to 95 moisture pints per 24 hours. We particularly found it appealing that houses with a square footage of as large as 5200 sq. ft. can easily be dehumidified using this unit. This is one of the best whole house dehumidifiers that is capable of performing within a temperature range of 50 degrees F to 104 degrees F. Moreover, it is wonderful enough to operate at a 40 degrees F dew point as well. Unlike the majority of the compressor based dehumidification systems out there, this one operates generating the lowest sound levels. It operates at 54 dB that is slightly lesser in comparison to the sound generated by a regular conversation. This is one of the most silent whole house dehumidifiers tested by our team of reviewers. When we tested the power consumption of this unit, we found out that it operates while consuming electricity lower than the usual dehumidifiers available out there. It also ensures 100% removal of moisture located in the damp ridden crawlspaces and basements, which makes it an efficient device. Since this is a large capacity whole house dehumidifier, it provides continuous drainage that is led by gravity. If you are one of those people who are concerned about their dehumidifiers turning back on in case of a power outage, this is the right pick for you. To help you enjoy an uninterrupted air dehumidification experience, this product offers both automated shut off as well as restart functions. We were fascinated to find that its auto defrost function turns the compressor off automatically in extremely cold conditions. A fan located inside the dehumidifier runs till the internal coils get properly defrosted. Aprilaire 1850F features a removable, washable MERV 8 air filter. This high-end filter facilitates the removal of different types of allergens, like dust particles, pet dander, and mold spore. Furthermore, since it is washable, there is no need to replace it ever. This unit is easy and simple to use. We found the interface to user-friendly since it allows you to operate the dehumidifier without any hassle. The product is easy and simple to use. It has a user-friendly interface that allows you to operate it without any hassle. With an auto-defrost feature, hassle-free drainage system, and 95-pint moisture removal capacity, this model easily deserves its place on the top of our list. Aside from being easy to use, it’s energy-efficient and operates quietly. This is the kind of product that you can buy once and enjoy without any problems for many years. It’s best for large spaces because of its bulky size. Like our number one pick, this dehumidifier is nearly silent. It can effectively dehumidify a large area within 24 hours! This unit is very easy to manage as well! This guide as well as our research report suggests the Aprilaire 1850 95 Pint whole house dehumidifier to be the runner-up in our ranking. This product comprises of a number of features that are offered by our number 1 pick. 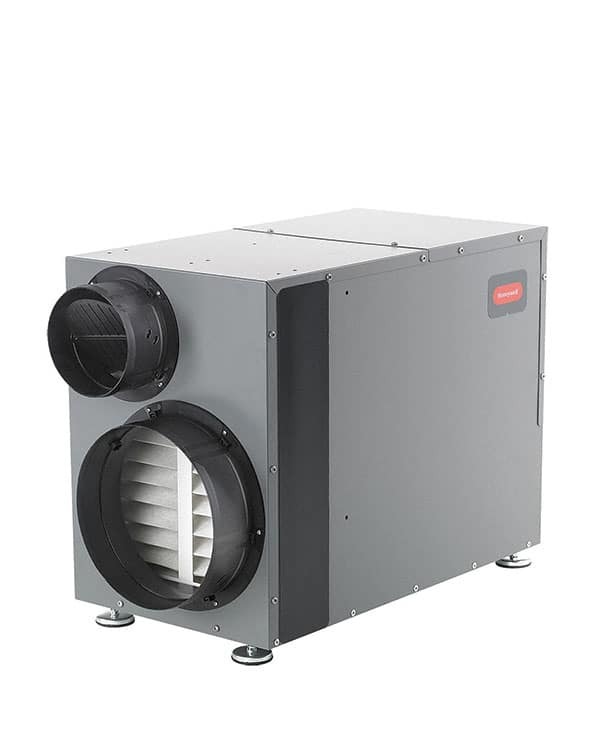 Although the air flow capacity and coverage capacity offered by this one is lower than the number 1 pick, it still contains a number of deciding features that make it a good choice. This top-rated whole house dehumidifier features a moisture removal capacity of 95 pints per day which is about the same as that of our number 1 pick. It is also capable of removing moisture from a covered area of 5000 square feet and helps greatly in the elimination of mildew, mold and unwanted odors. Moreover, it helps in reducing the humidity levels in your entire house, making your living environment comfortable and healthy. Just like our number 1 pick, this one is also capable of dehumidifying 95 pints of moisture from your air within 24 hours. 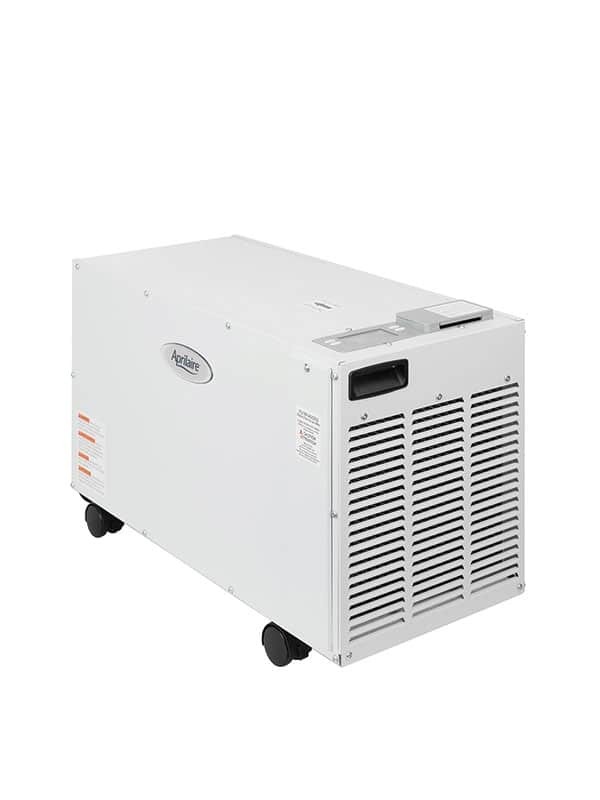 It can effectively dehumidify a covered space of up to 5000 sq. ft. We tested it in a 5200 sq. ft. house and it worked perfectly. This unit is capable of operating at a low temperature of 41 degrees F and at a high temperature of 104 degrees F. We operated the unit in different temperature ranges and we were simply fascinated by the results. The Aprilaire 1850 operates at a low noise level of 54 dB. If you are easily annoyed by noisy machines, you won’t be disappointed by this dehumidifier. In comparison to the other similar dehumidifier systems available for sale in the market, this product operates with almost 4 times more efficiently. Moreover, it is capable of removing 50% extra moisture per each kWh. Our team tested this unit under different moisture levels and the performance was nothing short of being perfect. This product comes with a drain port that lets gravity do its job to release the condensate continuously. The Aprilaire 1850 comes with auto shut off and restart features to keep you free of your obligation to manually switch your device on or off. 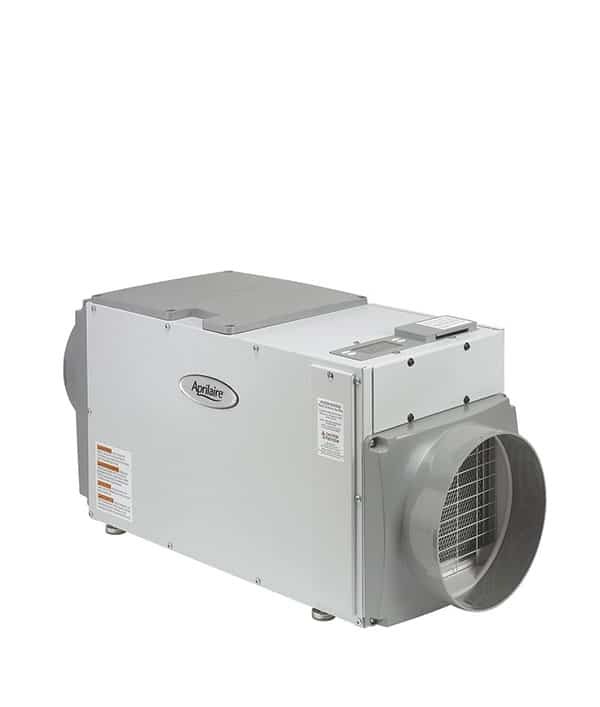 While operating at lower temperatures, this product turns its compressor off while an inbuilt blower starts to run in order to defrost the internal coils completely. This feature protects the dehumidifier from sustaining any damages. Just like the number 1 pick, this product also comes with washable, removable MERV8 filters. They allow you to enjoy allergens free air as they might be washed off easily for dust particles and mold spores. Its built-in humidistat enables you to run the dehumidifier at optimum levels. You may sustain the humidity at whatever level you want to as per your requirements. When we ran the dehumidifier in different humidity levels, it demonstrated clear changes in performance that endorsed the legitimacy of the humidistat. We particularly admire the fact that this unit is easy and convenient to use and maintain, so you’ve nothing to worry about if you don’t know how to maintain a dehumidifier. Cleaning it for debris and washing the filter for allergens can be done by following simple steps. This unit from Aprilaire comes extremely close to our #1 pick. It still offers the same efficiency, quietness, and ease of maintenance that we all love, but with a reduced area. This product also fell short on two things: customer service and price. However, for its price, you can enjoy years of efficient performance without having to worry about maintenance and cleaning. 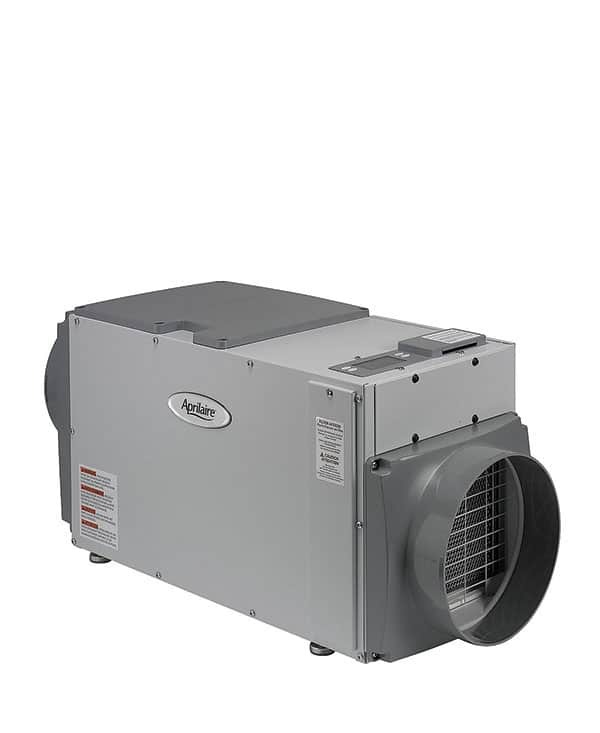 This unit can be used independently as well as with your AC. While it may only have the capacity to remove 70 pints per day, this product can dehumidify very large spaces. Why We Choose It as Our Budget Pick? Let’s first have a look at the reasons that compelled us to list it as our budget pick. Out of all the products we considered, this whole house dehumidifier comes at the lowest price while offering a number of effective and positive features. In simpler words, the Aprilaire 1830 whole house dehumidifier serves the best features for a budget-friendly price. Although its capacity to remove moisture is 70 pints per day, which is lower than the other reviewed products, it is capable of dehumidifying a covered space of 5000 sq. ft. The whole house dehumidifier cost for this product is what makes it the best choice. You may use it independently as well as in collaboration with your existing air conditioning system to enjoy the optimum balance between the humidity and dryness in your house. The Aprilaire 1830 can be the right unit for you if you’re aware of the reasons why you need a dehumidifier. This unit is capable of removing moisture summing up to 70 pints every 24 hours. When we tested it, we found out that it has the capability to work effectively in a covered area of 5000 sq. ft. The Aprilaire 1830 is capable of removing moisture summing up to 70 pints every 24 hours. It may work effectively for a covered area of 5000 sq. ft. Unlike the majority of the compressor-based whole house dehumidifiers out there, this unit is associated with quiet noise levels. It operates at only 51 dB which is much lower in comparison to other similar dehumidifiers. We were amazed by the fact that the noise produced by this dehumidifier was even lower than that of a regular conversation. Keeping in view its comparatively lower coverage capacity, this unit is energy efficient and consumes lower amounts of electricity. Since it is manufactured by Aprilaire, we found out that it isn’t any different from the high-end models from this brand in terms of energy consumption. Just like the other Aprilaire models, this one comes with a gravity-driven drain port. It provides continuous spilling of the condensate, freeing you from the requirement of emptying the drain tank after every few hours. The Aprilaire 1830 also provides the facility to shut off and restart itself automatically. If you live in an area where power outages are common, this model is the perfect fit for your needs. While operating at lower temperatures, even the best whole house dehumidifiers are prone to sustain a frosting on their coils. This product comes with an auto defrosting capability that shuts the compressor off and runs an inbuilt fan to defrost the internal coils properly before the dehumidifier starts functioning again. The product comes with detachable MERV 8 air filters that might be washed off conveniently. They are easy to detach and wash to get rid of different kinds of allergens like dust particles and mold spores. The Aprilaire 1830 features an inbuilt humidistat that enables you to control the humidity levels and sustain them at the optimum amount as per your convenience. This user-friendly dehumidifier requires only a low amount of maintenance. We opened up the device to get a first-hand exposure to its maintenance and the experience was quite reassuring since cleaning it up was easy. This product wins in terms of effectiveness and cost. It offers the same features we’d like to see in only the best home dehumidifiers, including quietness, ease of installation and hassle-free maintenance. This 70-pint dehumidifier is impressive, working well in small spaces, but it is a bit heavy in build and requires a higher CFM. If you’re looking for a unit that won’t send your electric bills through the roof, look no further. This model can run for long hours and perform in almost any normal temperature! Aprilaire 1850 is capable of removing 95 pints of moisture per every 24 hours. It may dehumidify a covered area of about 5200 sq. ft. We tested the unit for long hours and it worked well in accordance with the said capacity. This unit is capable of performing at a temperature ranging over 55 degrees F. Our volunteers tried operating it in different temperatures and it seemed to work just fine throughout the whole range. Since this one is a whole house dehumidifier, it may be installed away from the living space and bedrooms to make sure you don’t have to suffer any noise pollution. We found it to be a bit louder in comparison to other devices but installing it in a farther proximity helps you get over this downside. The product is qualified for Energy Star. This means that it won’t have a notable impact on your power bills. In comparison to other leading dehumidifiers available, we found that the Aprilaire 1850 is capable of delivering an efficiency of up to four times by removing 50% additional moisture content per every kilowatt hour. Aprilaire 1850 has a drainage port that drains out the condensate consistently. There is no need to empty the condensate tanks after every few hours. To ensure proper condensate drainage, it features 4 stabilizing feet that sustain the device in the proper orientation so that the liquid flows down its own natural course without coming across any hurdles or obstacles. An adjustable duct collar is also featured to help the device discharge the condensate from the side or the top as per convenience. An automated switch providing auto shutoff and restart capabilities is installed in the device. We specifically liked that it intelligently senses the levels of moisture in your house to maintain the environment at the most optimized humidity condition that is neither too little, nor too much. The product comes with a built-in sensor that detects humidity in your air and contains it to the most optimal levels. We tried toggling the humidistat at different humidity levels and it worked fine. The Aprilaire 1850 needs only a low amount of maintenance. There aren’t any messy water-filled tanks that need to be emptied all the time. We found a few features that make this dehumidifier stand out: a built-in humidistat, impressive operating temperature range, and energy efficiency. It’s a good choice if you want to dehumidify the entire house with the least maintenance. One of its major advantages is that it can cut down on your electricity bills without cutting down on its functionality. However, this unit is a bit bulky. This unit can remove up to 90 pints of moisture. It’s also affordable! 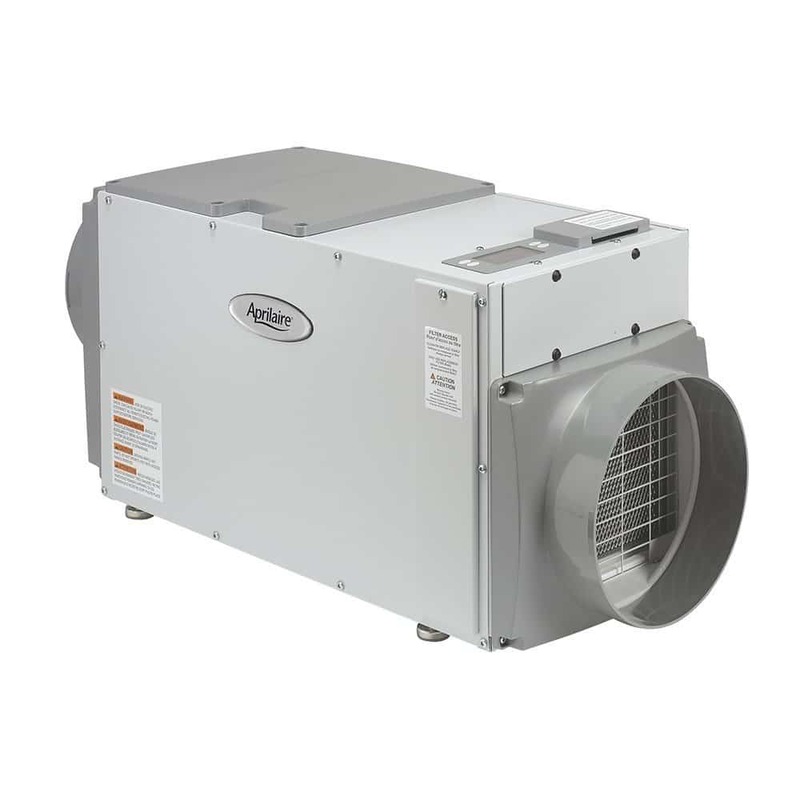 It strongly features integrated venting controls and an elegantly compact design with low maintenance needed! The Honeywell DR90 is capable of removing 90 pints of moisture every 24 hours. It may effectively dehumidify a covered area of almost 3100 sq. ft. It features integrated venting controls that make sure to bring clear air from the outside into your house. It also offers an inbuilt fresh air supply vent that keeps your indoors free of damped air. The dehumidifying unit is pretty compact in design and comes with the ability to dehumidify an entire house. The coils used in the product are coated using anti-corrosion materials which ensure its long operational life. Considering the unique combination of performance and efficiency, the Honeywell DR90 is a great choice for the dehumidification requirements of any household. We found this dehumidifier to be noisier in comparison to all the units mentioned above. So make sure that you choose the installation location for this unit wisely to enjoy a soundless experience. Honeywell is a known company for manufacturing energy-efficient products of all kinds. In continuation to the standard set up by the company, this product is also listed as an energy efficient product that comes with a 3.0 Energy Star rating. This means that the unit is an efficient device that does not consume a lot of electricity. The energy efficiency is achieved by the product by reneging the energy produced during the transportations between outgoing and incoming streams of air. Honeywell DR90 features a continuous gravity driven drainage system. We checked and found that the drainage hose is convenient to set up. The whole house dehumidifier is convenient to use. Since it’s a whole house dehumidifier, it may be placed somewhere away from the bedrooms and living spaces. Only a low amount of maintenance and periodic cleaning is required. The design of this unit is pretty compact and elegant which makes its installation easy. If you’re on a budget and you just want an efficient whole-house dehumidifier that has several impressive features, then look no further than the Honeywell DR90A2000. Its energy-saving feature makes it ideal if you want to cut on your electricity bills. Being a whole-house dehumidifier, you can place it at any area in the room, keeping it hidden, because it does look a bit bulky and noisy. We wouldn’t recommend this product if you have issues about warranty. To enjoy a long living and optimally performing dehumidifier, it is important to carry out the required maintenance on a regular basis. Some essential maintenance tips to increase your dehumidifier’s efficiency are given below. While placing your dehumidifier in a room, it is important to make sure that it is at least 6 inches away from any walls or other obstacles so that the exhaust and air intakes might not get blocked. The room where you are willing to operate the device must sustain a temperature of 65 degrees F or more, unless you own a low temperature dehumidifier. Otherwise, the working mechanism of the dehumidifier might sustain different kinds of damages. The humidistat enables you to control the levels of humidity present in your room. It is recommended to keep the humidistat in between 40% and 50% which is known as the ideal level. The compressor installed in a dehumidifier may overheat in case of abrupt turning off and restarting of the device. It is recommended to wait for 8 to 10 minutes before turning it back on so that the pressure might be equalized properly. Filters are installed in dehumidifiers to keep their internal mechanisms free of any allergens or dust particles. Therefore, it is recommended to replace the filter every once in a while so as to save your dehumidifier from any damages. ACH stands for Air Changes per Hour. It refers to the times that the air passes through a dehumidifier in one hour. CFM stands for Cubic Ft. per Min. It suggests the speed of air passing in or out of the dehumidifier. Humidistat is a controller that lets you control the level of humidity on your dehumidifier. HVAC stands for heating ventilating and air conditioning. It deals with the environmental comfort for homes and vehicles. Whole house dehumidifiers serve as the best solution to issues associated with high levels of humidity. Making use of such a dehumidification comes in handy when you or one of your family members is suffering from some sort of allergies, skin issues, heart complaints or breathing issues. All you need to do is to get a whole house dehumidifier for your space, plug it in and enjoy the fresh air free of any unwanted, hazardous impurities or excessive moisture amounts. In simpler words, buying a whole house dehumidifier is one of the best investments you could ever make to improve your home environment and health.